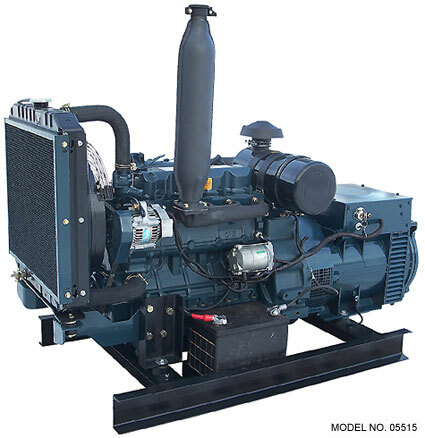 Kubota 15 kW Diesel Generator - This Kubota KB1500 diesel generator is suitable for continous use and has plenty of power to run your home, job site or business. This unit operates at 1800 RPM and with its super quiet muffler and 4 point vibration mounts, the KB1500 runs smooth and quiet. Like all Central Maine Diesel generators, this unit is fully customizable. From enclosure to fuel tank to controls to trailer, you choose the option that is right for you! And, as an added benefit, you will always have the flexibility to upgrade options later. This unit features a Kubota V1505 4 cylinder diesel engine, brushless generator end, liquid cooling, automatic voltage regulation, muffler, safety shutdowns, replaceable foam air filter elemant, steel skid base and key start panel.